My thanks go to my lovely friend and fellow Crazy Crafter, Satomi Wellard, who so generously taught me how to make this double slider card fold. The products in this card are a mix of the current, retiring and the new. 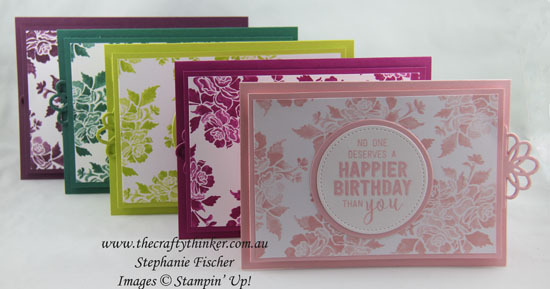 The new is the gorgeous Fresh Florals Designer Series Paper Stack. 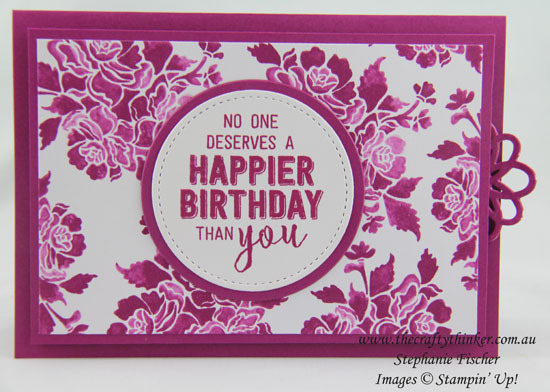 For this card, I chose the new In-Colour Berry Burst but the pack includes papers in all of the new In-Colours - each in four designs. 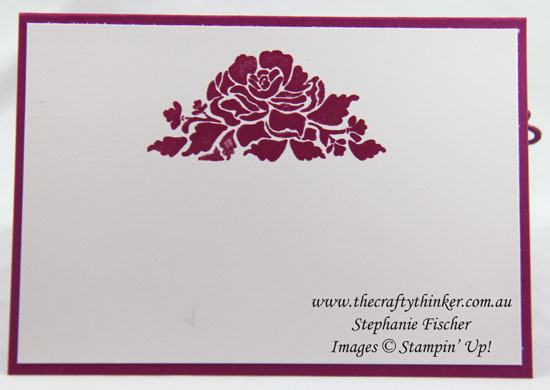 I matched the gorgeous floral paper with Berry Burst cardstock and ink for a monotone card. The "Make A Wish" greeting is from the new stamp set, Happy Birthday Gorgeous. The greeting "Surprise" is from the new Birthday Delivery stamp set. The current products are the Circle and Square Stitched Shapes Framelits and Layering Circles Framelits. I used the method shown in this post to cut oblongs with the square framelits. 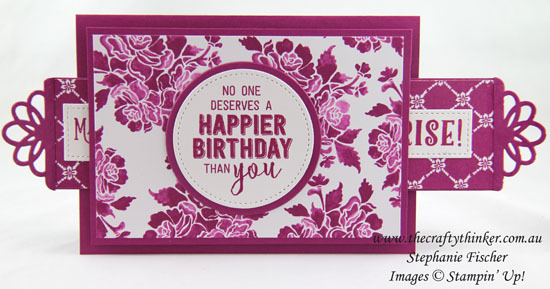 I used the new Berry Burst ink and the current Floral Phrases stamp to create a matching interior for the card. The inside of the card matches the outside - of course! The retiring product is the floral tag topper from the Balloon Pop-Up Thinlits Dies and the large greeting from Balloon Adventures. I liked it so much that I made four more so that I ended up with one in each of the new In-Colours for 2017-2019!